The report, dated Oct. 3, 2018, shows that Vale classified Dam 1 at the Córrego do Feijão mine in Brumadinho as being two times more likely to fail than the maximum level of risk tolerated under the company's own dam safety policy. Vale did not immediately respond to a request for comment. It has previously cited an independent audit last year declaring the dam safe and said that equipment showed the structure was stable just weeks before the collapse. The previously unreported document is the first evidence that Vale itself was concerned about the safety of the dam. It raises questions as to why the audit around the same time guaranteed the dam's stability and why the miner did not take precautions, such as moving a company canteen that was just downhill from the structure. U.S.-listed shares of Vale extended losses following the Reuters story, dropping as much as 2.6 percent to $11.10. The company has lost a quarter of its market capitalisation — or nearly $19 billion — since the Jan. 25 dam collapse, Brazil's most deadly mining accident. The disaster in the mineral-rich state of Minas Gerais was the second major collapse of a mining dam in the region in about three years. Entitled "Geotechnical Risk Management Results," Vale's internal October report placed the Brumadinho dam within an "attention zone," saying that "all prevention and mitigation controls" should be applied. Reuters was unable to confirm whether the board or CEO Fabio Schwartzman were made aware of the risk associated with the dam. Vale has consistently said the collapsed dam was declared sound by an independent auditor in September. 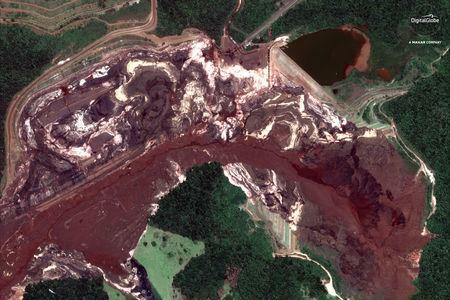 Its internal report identified static liquefaction and internal erosion as the most likely causes of a potential failure at the dam in Brumadinho. Liquefaction is a process whereby a solid material such as sand loses strength and stiffness and behaves more like a liquid. It was the cause of the 2015 dam collapse, at a nearby mine co-owned by Vale, which resulted in Brazil's worst-ever environmental disaster.